SpeedSkin's® opaque, keyboard covers for typing accelerate keyboard memorization and train students to keep their eyes on the screen - not on their fingers. Do you students watch their fingres as they type? Do they "hunt and peck" with two fingers? When you use SpeedSkins with your typing software, they will train users to keep their eyes on the screen, not on their fingers. 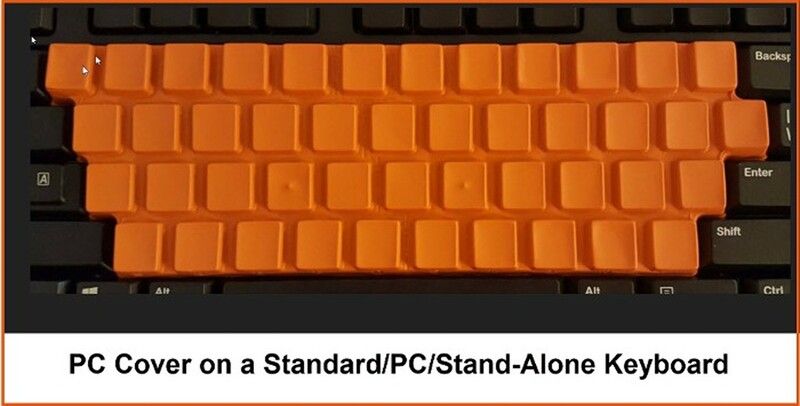 SpeedSkin computer keyboard covers eliminate the option to peek at the keyboard, assisting users to learn to type quickly and properly. Requires students to concentrate on touch-typing. Improves keyboard memorization, speed, and accuracy. Covers only four rows: letter, number, and punctuation keys. Format and function keys remain visible. Easily lifts ON and OFF in one-step as a unit. Home-row indicators give a tactile starting place. Bright orange color for easy classroom visibility. How to type faster: Covers work with all keyboarding software or textbooks. Precision-molded from touch-sensitive polyurethane -- NO latex. 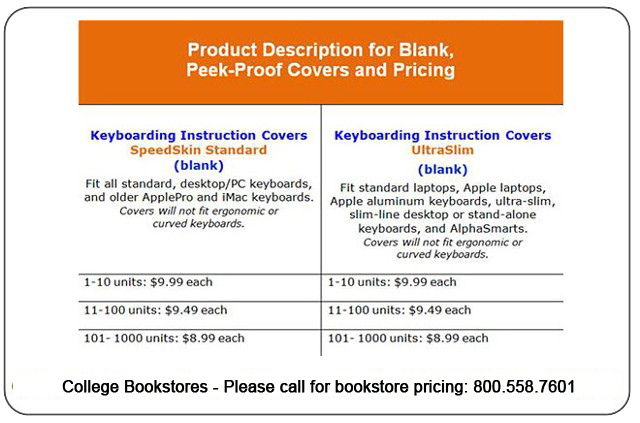 One-size, standard/PC cover fits all standard, PC-style and ApplePro keyboards. One-size, UltraSlim cover fits all standard laptops and slim-line, Chromebooks, and stand-alone desktop keyboards. Durable: SpeedSkin covers have been laboratory tested and certified to over 1 million impacts without discernible wear. Washable with mild soap and cold water. 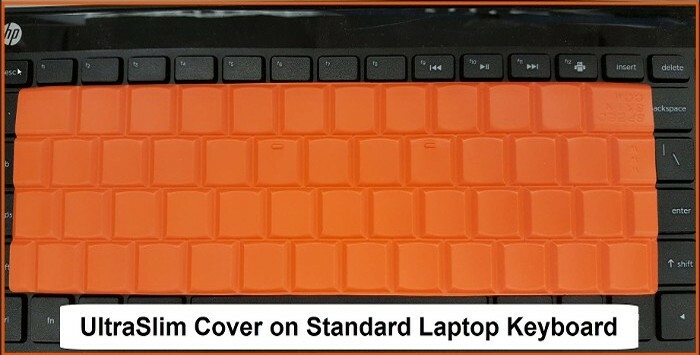 Each cover comes with a heavy-duty, plastic storage tray to ensure long-term functionality and preserve its shape when used between typing sessions. 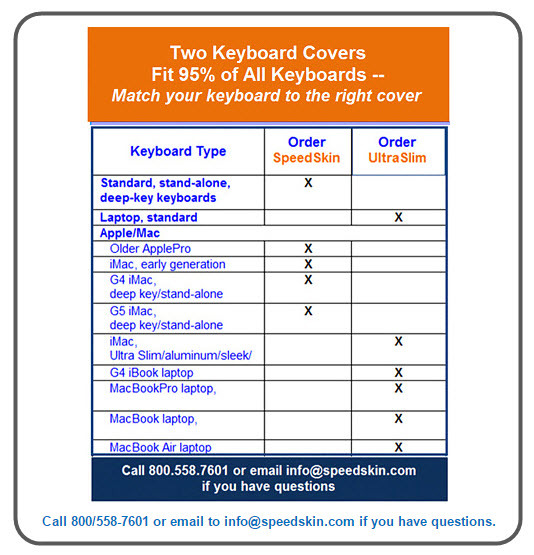 Teachers require, and students request SpeedSkin's peek-proof covers - they meet and exceed expectations! UltraSlim Covers Fit Chromebook Laptops! Return to Home for ordering options, Shipping & Handling charges, and Exchange and Refund policies.